Great Opportunity in Oconee! Charming move-in ready home on a spacious lot with a private, fully fenced backyard. The homes is a 3/2 with an open and inviting floorplan. Vaulted ceilings & bright windows in the Living room are anchored by a cozy fireplace. The living and dining area flow into kitchen with brick floors and concrete countertops. 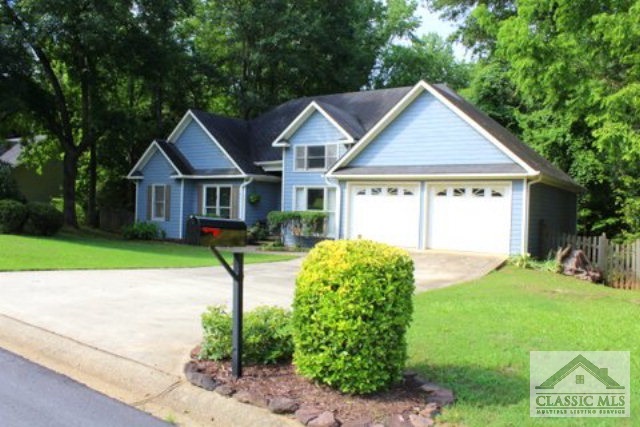 The home has an oversized 2 car garage with huge walk up attic for additional storage. The master suite features a large walk-in closet with built in storage. The master bath has separate tub and shower. The two additional bedrooms and hall bath round out the back hall, all neatly tucked away from main living area of home. Nice private back deck ideal for entertaining or watching the wildlife. This is truly a great find in Oconee! Morgan Manor is a subdivision within the city of Watkinsville, Georgia. There are currently 0 Homes for Sale within Morgan Manor, with asking prices ranging from $0 to $0. The average list price per square foot of the available inventory in Morgan Manor is $0, which is the Watkinsville average of $249. The Average Sales price of all sold real estate in this subdivision for the past year is $181,000. Recent comparable homes have been selling for 96.03% of their asking price. Waterfront homes represent of the available Morgan Manor inventory. The population of Watkinsville, according to the 2010 Census, is 2,832. The total number of households in the zip code of Morgan Manor is 6,126, with an average household size for of 2.78 people. The total number of renter households within the zip code of 30677 is 1,117, which means that 81.77% of households in this zipcode are owner occupant households. 1231 Katie Lane, Watkinsville GA 30677 is a Home, with 3 bedrooms which is recently sold, it has 1,478 sqft, 0.0 - 0.25 sized lot, and Attached,Garage parking. A comparable Other, has bedrooms and 0 baths, it was built in and is located at and for sale by its owner at $ 0. This home is located in the city of , in zip code , this County Other, it is in the Subdivision, and Carolinas Place are nearby neighborhoods.